Caledonia is at the intersection of US 30 and PA 233. From Chambersburg, follow US 30 east 11 miles to the park. From Gettysburg, follow US 30 west 15 miles to the park. From Harrisburg, follow I-81 53 miles to Chambersburg, then 7.3 miles east on US 30. Wi-Fi is available inside the park office and within approximately 50 feet surrounding the office building. Wi-Fi is not available in the campground or day-use area. Caledonia’s Summer Sunday School dates back to the summer of 1917 when the Manges and Moyer families decided to provide a Sunday school for their and other families’ children who spent the summer months vacationing at Caledonia, be it in tents or the increasing cabin community around the park. Since 1955, the Franklin County Sunday School Association has kept the tradition alive and offers outdoor, nondenominational Sunday school from Memorial Day Weekend to Labor Day Weekend. This event is held annually on the second Saturday during July. As many as 150 skilled crafts people and artists display and sell their creations. A park educator offers programming during the summer season. The history and environment of the area are topics for discovery for park visitors of all ages. Children’s programs, guided walks, and campfire programs are scheduled throughout the summer season. The Thaddeus Steven Blacksmith Shop has operating hours during the summer. Visitors can tour and, on occasion, visit with a guest blacksmith as he hammers out iron products. 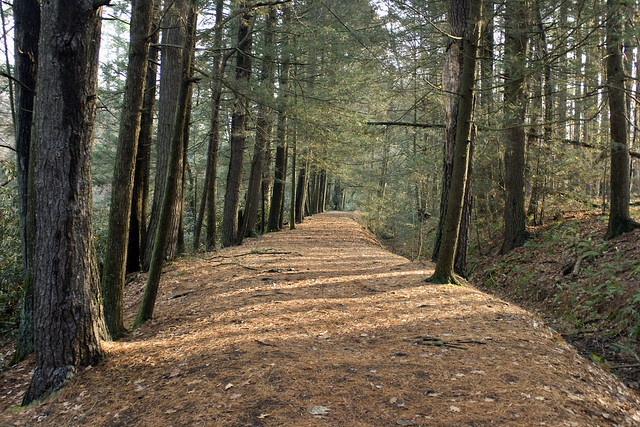 The park also is the home of the Pennsylvania Forest Heritage Discovery Center, located across from the park office.